Sliding centrifuge TURBOCASCADE by SIEBTECHNIK TEMA. 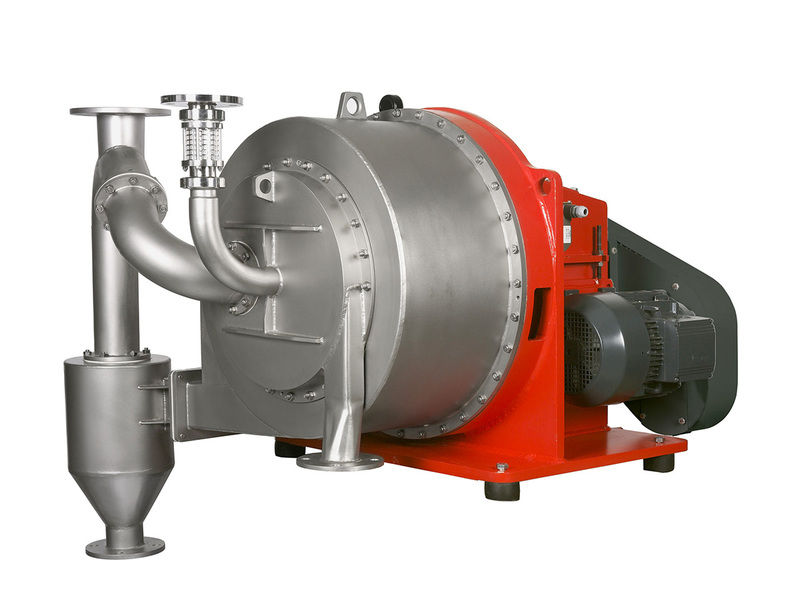 The TURBOCASCADE sliding centrifuge is a special unit that is used mainly for the dewatering of granulate-like particles. 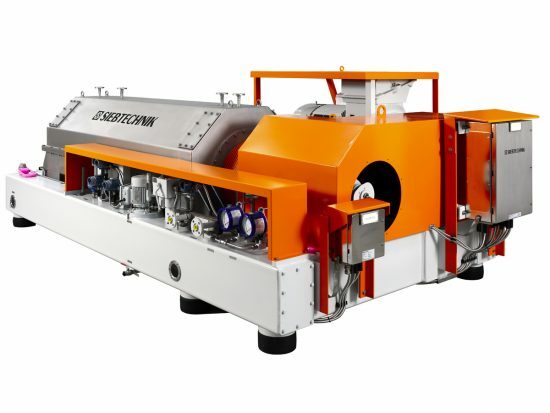 The main areas of application for this machine are polymer pellets that are especially carefully separated from the carrying water or from a suspension. Despite the short time spent by the products in the centrifuge end-moisture levels of up to 0.05 % are achieved. During operation the solid particles slide through the stepped screen basket. 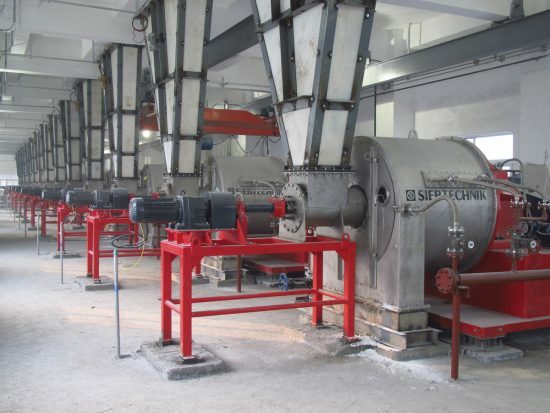 The stress on the polymer granulate, as well as product abrasion, is very low. This is achieved primarily by a special material guidance system and our Conidur® or OPTIMA screening devices. 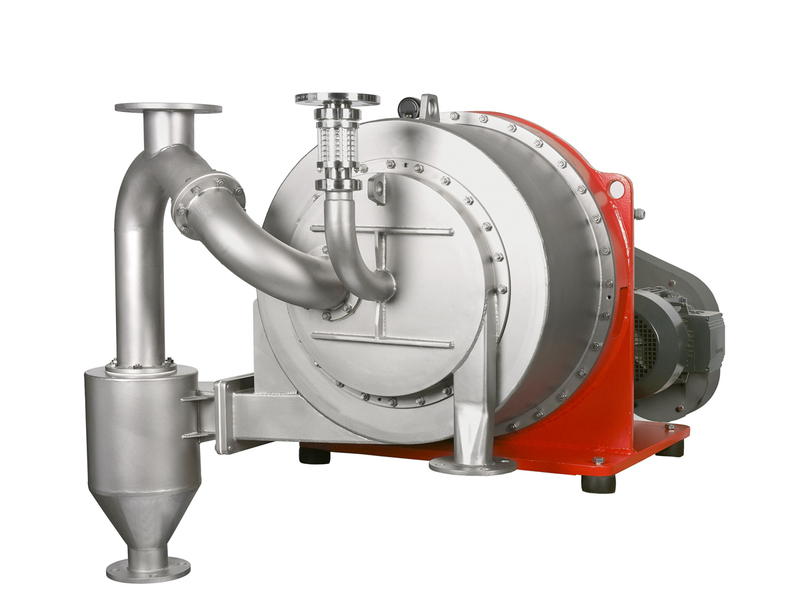 Separation is nevertheless intensive and through purely mechanical separation a very low residual moisture level is achieved.Normally the centrifuge is operated with an adjustable pre-watering system to separate part of the carrier water before centrifuging. 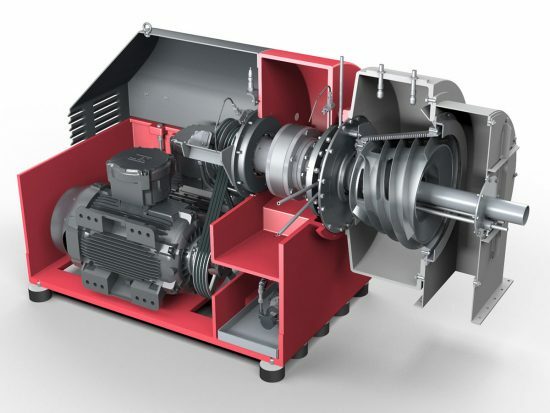 The capacity of the TURBOCASCADE is considerably enhanced by this. The centrifuge takes up very little space, considering its separating capacity. Depending on requirements and operating conditions, we use as the screening elements Conidur® perforated plates or slotted screens, which because of their self-cleaning properties are not blinded with granulate splinters or threads. We also make the TURBOCASCADE gas- and vapour-tight. Here the circulating air is first cleared of any water carried with it in a cyclone separator and then returned to the housing. Thanks to this design principle the heat losses in the centrifuge are very slight. The dewatered solid can be discharged in any position, vertically or horizontally, as the customer requires.